The St. John’s River in northeastern Florida is the longest river in the state. It contains over 200 miles of navigable stream and empties into the ocean near Jacksonville, FL. There are over major 25 bridges built along this river, the first dating back to the early 1900’s. In 2013, one of these bridges, along State Road 415 (SR-415), was changed from a two-lane bridge to a twin bridge, and needed a larger fender system. A durable and long-lasting solution was needed for this new fender system. United Infrastructure Group (UIG) is one of the leading contracting firms in the infrastructure industry and specialize in markets including engineering, construction, environmental and many more. For this project, UIG was the primary contractor. UIG has over 85 years of experience in providing companies with technical experience in the transportation and safety arenas and have completed over 250 bridge construction projects. 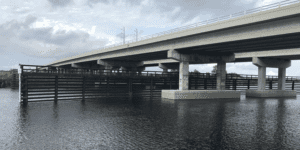 United Infrastructure Group was involved in the project through The Florida Department of Transportation. This executive agency’s primary responsibility is to plan and develop safe, viable and balanced state transportation systems for the entire state of Florida. The FDOT specified plastic lumber for part of the project and Bedford Technology worked with UIG, and won the bid because of the low cost and performance characteristics. The FDOT was in charge of the design, planning and implementation for the SR-415 project, and they looked to UIG to find a building material that was sustainable and long-lasting. The biggest challenge in this project was finding a strong and durable solution at a low price. The Florida Department of Transportation (FDOT), who was in charge of the design, put the project up for bid and UIG partnered with Bedford Technology to offer a solution that met all of the project criteria. The original design included a combination of 244 pre-stressed concrete piles and additional plastic lumber whales for support. This solution for the larger fender system was durable and long-lasting, and could absorb the energy from vessel impact. United Infrastructure Group partnered with Bedford Technology for the recycled plastic lumber portion of the project. As the only manufacturer of marine-grade structural recycled plastic lumber (SeaPile® and SeaTimber® by Bedford Technology), these Bedford Technology products were the best solution to meet the building material and timeline specifications: a high level of energy absorption, extreme durability and moisture resistance. The design was then given to the in-house engineering team at Bedford Technology. After understanding the new fender system design and project requirements, our team saw an opportunity for better performance. Pushing the limits of the original design, our team reassessed the project elements and offered a new and improved solution. This included replacing all of the pre-stressed concrete piles with fiberglass reinforced recycled plastic piles. The idea behind this redesign was that much less material could be utilized, saving installation cost and time for the entire project, while still meeting (or exceeding) all of the material requirements. The new design replaced 244 pre-stressed concrete piles with 52 recycled plastic piles, greatly reducing the amount of material and installation cost, while exceeding the energy absorption requirements. The new design was then reviewed and accepted by the FDOT and the project construction began. Innovation was at the heart of this project, and from it a better, more cost-effective and long-term solution was found. This is just one example of how Bedford Technology constantly pushes limits and boundaries to find the best solution for projects. The new concept included many benefits for both the contractor and the customer; the installation cost was greatly reduced, the project schedule became shorter, and the FDOT received a better energy absorbing fender system that offered enhanced longevity due to the building material. The structural recycled plastic lumber, engineered by Bedford Technology, exceeded the energy absorption requirements and had much better performance characteristics than the pre-stressed concrete piles. Since the project was completed, the new bridge fender protection system is fully intact and has not needed any replacement.